OWC Mercury Rack Pro 0GB 1U 4 Bay Rack Storage Solution Kit. 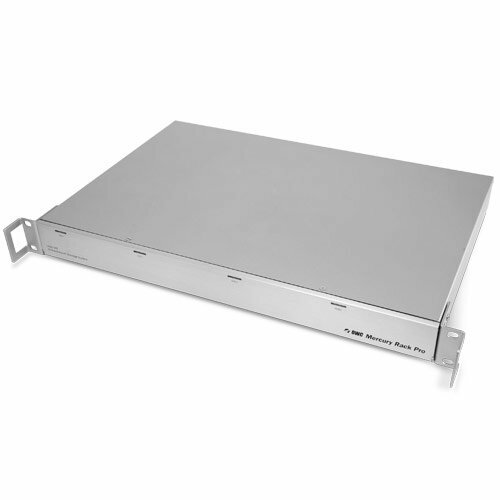 The OWC Mercury Rack Pro features a single external mini-SAS interface, to not only reduce cable clutter, but to provide four full channels of data (one per drive) through a single external mini-SAS cable. It's like having four separate eSATA/SAS cables but in a single package. Designed specifically to meet the demands of server, audio production, and video production environments, the OWC Mercury Rack Pro four Bay 1U Solutions provide data transfer rates of up to 24Gb/s data rates. Using the highest capacity SATA hard drive mechanisms available, and offering Plug & Play simplicity, the possibilities are endless! Note: OWC Mercury Rack Pro solutions do not include rack rails. Using the fastest SATA drive mechanisms available gives the OWC Mercury Rack Pro mini-SAS 4 Bay 1 U Solutions a solid, performance focused base. Adding a high-speed external mini-SAS card (not included) further enhances the OWC Mercury Rack Pro providing some of the fastest drive transfer rates possible, up to 24Gb/s¹! The OWC Mercury Rack Pro can easily be converted to a desktop form-factor via a Phillips screwdriver by simply removing the rack ears and installing the included anti-skid, vibration dampening feet. Includes: OWC Mercury Rack Pro 4 Bay, Integrated Power Supply, Rack Mounting Handles, Anti-skid, Vibration Dampening Desktop Mounting Feet, Screws for Rack / Desktop Conversion. Includes: OWC Mercury Rack Pro 4 Bay, Integrated Power Supply, Rack Mounting Handles, Anti-skid, Vibration Dampening Desktop Mounting Feet, Screws for Rack / Desktop Conversion.